History- Um... well... Tellka's kinda dead right now. =0-o= See, she lived about 250 before the second destined cycle and um... ~thinks~ well, I have no idea what time our whole writing takes place at... I'd imagine it's sometime around the 6th cycle maybe? :P Bah, but that brings in a bunch of technicalities and forces me to go off subject. Anyway, Tellka's history, she died 250 years before the 2nd destined cycle in a large fight with a demoness named Ravyn. Thanks to the way she died, Tellka's soul managed to get stuck in a warped destined cycle, leaving half of her spirit restless and in a state of isolation, not quite dead but really not alive. =^-^=;; The other half of her spirit was then reincarnated into Kate Chan, and when Kate was about three years old, Landon ressurected Tellka's spirit and gave her a body much like hers before it was destroyed. Tellka's now bound to protect her reincarnated self until her half of her spirit is called back into its state between life and death. 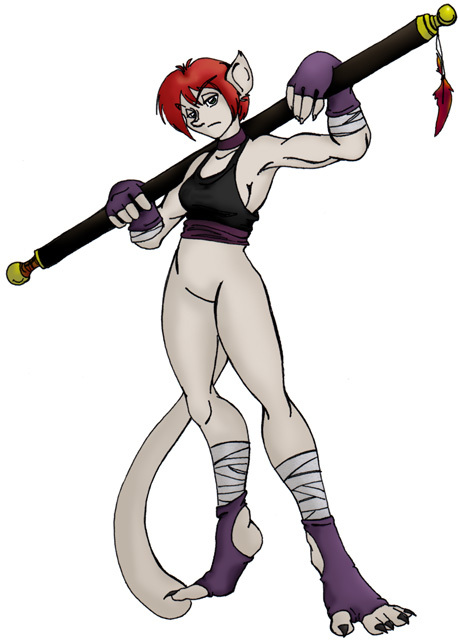 Fighting Style- Very skilled in woren fighting tactics, but most of her style she's built up on her own, so it really doesn't have a general name. Special Ability- Revert, allows her to shift from her physical body for to her spirit form where she can move around undetected ~unless you're a medium or something. =0-o= Then you'll sense she's around~ In this form, Tellka cannot touch, smell or talk, but she can see and hear what is going on around her. She's also able to telepathically communicate with Kate, since they share the same soul. Favorite Possession- Her self-made staff, even though she makes a new one every few years or every time her old one breaks. Favorite Thing to do in Spare Time- Practice/fight/train at the coloseum. Worst Fear- Basically, her past catching up with her. Useless Talent- Can speak fluently in original woren tongue. Personality Quirk- Almost a polar opposite of Kate, Tellka being the evil side. :P This has to do with the split spirit thingy between them, it's not just a coincidence. Oh yea, during her lifetime she was able to have a face off with the guy who killed her parents. I think Tellka's biggest regret is not killing him off when she had the chance. Only reason she didn't do it was because of a convincing remark said by one of her friends who was there at the time.